The march of Spring. You have not long to prepare. The asparagus are coming, from many directions. From California and Mexico, where they have been up and harvesting for weeks—from Springfield, Oregon, to Springfield, Missouri, to Springfield, Massachusetts—where they are just beginning to push through the warm soil. The first arrivals, at least in terms of the truly fresh product, will be skinny and even straggly. They will be a little uneven—some stalks thicker than others. Separate them by size, giving the thicker pieces a headstart when you cook them. Asparagus seems a sturdy enough sort but, in truth, its actual season is typically no more than two months long. When it comes, you should eat a lot of asparagus. It will not last into the heat of summer. The local asparagus is its own sort and gift. You can break its stem and hear a loud crack—you can cook it in a few moments—you can trust it will not turn stringy or sour. A good local asparagus will not be parceled off; there will be no end pieces left on the plate. And its notorious odor will be minimized. You will need a good market or farmers market or roadside stand to get local asparagus. When it comes, jump to it. I soak all asparagus first in cold water. I trim the ends and then rinse the stalks and let them sit in cold water for five minutes. It hydrates the asparagus, and they cook more quickly, for they are already wet with some moisture within them. Do not soak them for thirty minutes, you are not trying to get them soggy. Just a quick dunk. Cook with some abandon. Trim each piece, no matter how skinny, soak them, drain them for a moment, blanch them in salted water for no more than thirty seconds, drain them again and let them sit and dry for a second on paper towels. Heat a large sauté pan on medium high for one minute and then add some light extra virgin olive oil. Swirl that until it has grabbed some of the heat, add a couple of crushed fresh garlic cloves, a pinch of dried red pepper, swirl about again and add the asparagus. It should all be very lively, so keep shaking and mixing the pan, so all the asparagus will touch the garlicked oil. Quickly add some good salt and fresh ground black pepper and you are done. Tilt the pan out onto a large warm platter or plate. In all, the asparagus should have sautéed no more than two minutes or so. It is young and will cook quickly. Let these first stalks sit a-jumble on the plate, like the first toss of pick-up sticks. 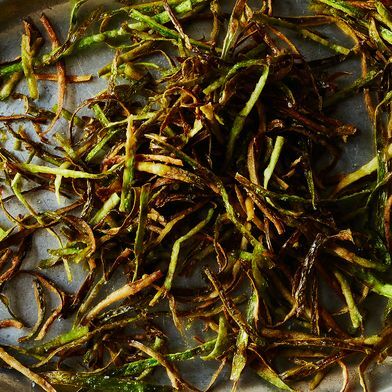 You can dot the asparagus with drops of balsamic vinegar—or swirls of fresh Parmesan—or chives and a little olive oil, or chopped parsley or cilantro or both, and always a touch more salt and pepper. It must all be done quickly to protect the youth and freshness of the first asparagus. To spring. You must then peel the thicker ends a little, with a swivel blade peeler. At the Canal House, they do this by laying the stalks flat on the counter and rolling each piece as you shave it. They do not want any of the stalks to break, such a look they give if you break one. Once the thicker stalks have been peeled, then lay them in salted boiling water ( or steam them ) but do not walk away, or get distracted. They will only need a minute more than the skinny batch to be perfectly cooked. Better by far they be undercooked—if you can smell the asparagus, then it is late. Drain them quickly and lay them on the paper towel; it is warm water you must get them away from, for they will keep cooking. With these thicker stalks, you can then sauté them in olive oil for two or three minutes, adding chopped garlic and tiny minced pieces of lemon. Or lay them in a shallow mixing bowl and combine with some arugula and a fresh vinaigrette and then lay that out on separate plates. Always finish with a few flakes of good salt. They are the lovely, elegant spears of spring, each one elegantly dressed from headdress to toe in varied green shades. The first fresh arugula and spring garlic are both arriving on the same train—use them in every way with the asparagus. Yellow curls of a soft Parmesan cheese fit perfectly this group, even as it was a product the previous spring. If you have been careful with the details, with the washing and peeling and soaking and blanching and such, if you have moved quickly and the asparagus is truly fresh, then it is quite easy to be pleased. This article was written by Peter Miller from Food52 and was legally licensed through the NewsCred publisher network. Please direct all licensing questions to legal@newscred.com.